Villagers in flood-ravaged Boscastle hope to see a change in their luck when a medieval horseshoe goes on sale on internet auction site eBay on Friday. Farmer John Northey, from Clether, is advertising the 550-year-old shoe, which has a starting price of £10,000. He has pledged to donate 25% of the money raised to the fund for the north Cornwall flood victims. 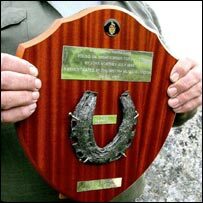 Mr Northey, 61, found the medieval horseshoe with his metal detector on Bodmin Moor in 1993. The former forestry worker was about to throw the horseshoe away, but sent it to the British Museum after he noticed it was strikingly different from modern horseshoes. Museum experts provisionally dated it to about 1450, making it the oldest horseshoe known to have been found in Cornwall. Mr Northey has made 400 replicas of the horseshoe. He sent one to the Queen on her 70th birthday in 1996 and another to a riding school in New York after the September 11 terrorist attacks. The farmer, who has a 31-acre smallholding on the edge of Bodmin Moor, realised the sale of the horseshoe could help those affected by the dramatic flash floods of 16 August. He said: "As I lay awake on the night of the Boscastle floods, I decided to put this good luck symbol to good use."